Based on nature’s methods. Proven, unique three-fold effect for complete wound healing: antimicrobial, soothing, enhances re-epithelialization. Proven cost-effectiveness. In everyday home use Abilar is a natural method that can be used for scratches, abrasions, inflamed and irritated wounds, burns etc. regardless of wound type, etiology and exudate level. 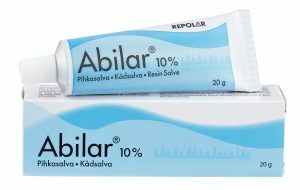 In professional use Abilar 10% Resin Salve is superior in treating complex, hard-to-heal wounds regardless of wound type, etiology and exudate level. Repolar Pharmaceuticals researches, develops and produces wound and skin care products for both human and animal healthcare. Repolar products are based on active components of the Norway spruce resin using the Resol® Technology developed by Repolar. All products are based on scientific research and developed in Finland. The healing of tissue damage is a requirement for the maintenance of life: the healing of a skin wound is a complex and finely controlled series of events at the cellular and molecular level. Wound healing is divided into three phases: 1. inflammation, 2. fibroplasia and 3. maturation. The end result of healing is a connective tissue scar which fills the wound defect and endows the healed wound with sufficient strength. The maturation of the scar tissue of the wound requires about a year. Wounds may be classified according to causal mechanism, conditions and energy into acute, chronic, superficial, deep, contaminated and clean wounds. Most often acute wounds are the consequence of unintentional trauma or, for example, an intentional surgical procedure which damages the skin. A superficial wound extends maximally through skin layers only, whereas a deep wound may pierce the skin, the dermal tissue below the skin, the muscle sheath, the muscles and extend into bone or a body cavity and in addition may cause serious damage to internal organs. Typical contaminated wounds are bites, wounds from knives or broken glass and those resulting from falling or wounds and abrasions caused by other types of trauma. A wound always becomes contaminated if saliva, sand, soil etc. get into it in connection with an accident. A surgical wound is a perfect example of a clean wound. Typical symptoms of an acute wound are pain and bleeding. The first aid is to stop the bleeding and keep the wound clean. According to the causal mechanism an acute wound may either be sewn together surgically or left open. In the case of bites or clearly contaminated wounds it is wise to confirm the patient’s immunization status. 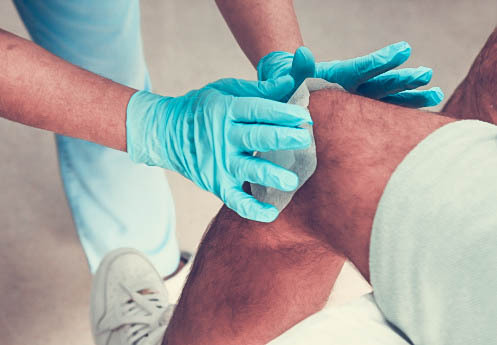 After first aid it is important to provide an optimal environment for wound healing. A dirty wound should at least be washed or as necessary cleaned mechanically (debridement, surgical revision) and protected with clean gauze or bandages. In the ideal case an acute wound heals per primam, when the edges of the wound are brought into contact and when there is sufficient blood flow and when infection is absent. Depending on the causal mechanism the wound will either heal or then it heals by secondary intention (per secundam) when granulation tissue forms in a wound left purposely open and the wound edges are slowly drawn together gradually reducing the surface area of the wound. Typical wounds which heal per secundam are irregular dirty wounds and bites in which the risk of wound infection is great. If the healing of an acute wound slows or completely stops the wound may become a chronic one. A chronic wound is one where healing has become prolonged for one reason or another. A chronic wound may remain open, even for years. The tendency for a chronic wound to heal and its rate of healing are difficult to predict and even a wound which has once healed may open again. Typically chronic wounds are venous and arterial leg ulcers, pressure sores and diabetic leg ulcers. A chronic wound is often a secondary manifestation of some chronic disease affecting the patient. Hence the cornerstone of treatment of a chronic wound is treatment aimed at the causal etiology of the wound: the most important precondition of healing a wound is therapy of the disease causing and maintaining it. In addition to this causal treatment an important precondition for wound healing is careful and appropriate execution of the local treatment of the wound itself. The aim of local treatment is to create optimal conditions for healing the wound. Correctly executed local treatment accelerates the healing process and prevents wound infections. Excluding operative wounds, achieved in aseptic conditions, all wounds should be regarded as contaminated and that is that bacteria have invaded them. The classical manifestations of wound infection are redness, swelling, hotness, pain and accumulation of pus. The most common wound infection is with the bacterium Staphylococcus aureus. In hospital and hospice patients with many diseases less common gram positive bacteria can cause wound infections. Bacteria and funguses which do not cause infections in healthy people, may cause opportunistic infections in patients whose resistance, i.e. their immune capability, is weakened, for instance, in immunosuppressive therapy or in the context of an immunosuppressive disease. In severe infections or special cases, in addition to the local treatment, oral or intravenous antibiotic therapy is given. Before beginning antibiotic therapy bacterial culture specimens should be taken from the wound. Dead or necrotic tissue in or around the wound slows its healing and increases the risk of wound infection. Hence it is appropriate to remove necrotic tissue from the wound surgically (debridement). In many cases the necrotic tissue or cell debris in the wound can be cleaned away without surgical instruments, as part of the normal wound care. Effective local treatment of a wound has, as with its causal treatment, a very important role. The meaning of local treatment is amplified especially in patients being outside possible surgical treatment for example because of their general condition. In practice this is so in a patient with many diseases, with a bad prognosis, often in longterm care institutions for whom it is unreasonable to consider extensive surgical wound revision, challenging pedical grafts or vascular reconstruction. However, the acute and chronic wounds of such patients must be treated appropriately and as well as possible. The basis of wound treatment in these cases is to use effective means of local treatment. A good local treatment preparation provides optimal conditions and possibilities for the wound to heal, is safe and efficacious and has been well proved in practice for various wounds and in different patient groups. Sipponen A. Coniferous resin salve, ancient and effective treatment for chronic wounds – laboratory and clinical studies. Department of Orthopedics and Traumatology, Helsinki, University Hospital, Faculty of Medicine, University of Helsinki, Helsinki, Finland 2013. Sipponen A, Kuokkanen O, Tiihonen R, Kauppinen H, Jokinen JJ. Natural coniferous resin salve used to treat complicated surgical wounds: pilot clinical trial on healing and costs. Int J Dermatol 2012;51:726-32. Sipponen A, Jokinen JJ, Sipponen P, Papp A, Sarna S, Lohi J. Beneficial effect of resin salve in treatment of severe pressure ulcers: a prospective, randomized and controlled multi-center trial. Br J Dermatol 2008;158:1055-62. Lohi J, Sipponen A, Jokinen JJ. Local dressings for pressure ulcers: what is the best tool to apply in primary and second care? J Wound Care 2010;19:123-7. Sipponen A, Jokinen JJ, Lohi J. Resin salve from the Norwegian spruce tree: a ‘novel’ method for the treatment of chronic wounds. J Wound Care 2007;16:72-4. Lohi J, Sipponen A, Rautio M, Jokinen JJ, Saranpää P. Resin-salve from Norway spruce – a potential method to treat infected chronic skin ulcers? Abstract. 15th Nordic congress of general practice. Reykjavik. June 13-16. 2007. Rautio M, Sipponen A, Lohi J, Lounatmaa K, Koukila-Kähkölä P, Laitinen K. In vitro fungistatic effects of natural coniferous resin from Norway spruce (Picea abies). Eur J Clin Microbiol Infect Dis 2012;31:1783-9. Sipponen A, Laitinen K. Antimicrobial properties of natural coniferous rosin in the European Pharmacopoeia challenge test. APMIS 2011;119:720-4. Sipponen A, Peltola R, Jokinen JJ, Laitinen K, Lohi J, Rautio M, Männistö M, Sipponen P, Lounatmaa K. Effects of Norway spruce (Picea abies) resin on cell wall and cell membrane of Staphylococcus aureus. Ultrastruct Pathol 2009;33:128-35. Sipponen A, Rautio M, Jokinen JJ, Laakso T, Saranpää P, Lohi J. Resin salve from Norway spruce – a potential method to treat infected chronic skin ulcers? Drug Metab Lett 2007;1:143-5. Rautio M, Sipponen A, Peltola R, Lohi J, Jokinen JJ, Papp A, Carlson P, Siponen P. Antibacterial effects of home-made resin salve from Norway spruce (Picea abies). APMIS 2007;115:335-40. Jokinen JJ, Sipponen A. Refined spruce resin to treat chronic wounds: rebirth of an old folkloristic therapy. Adv Wound Care 2016;5:198-207.